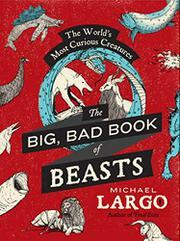 In the great tradition of the bestiaries of yore, Allied Artists researcher/archivist Largo (Genius and Heroin: The Illustrated Catalogue of Creativity, Obsession, and Reckless Abandon Through the Ages, 2008, etc.) parades the real, the extinct and the imagined for our shivers and delectation. The author delivers plenty of the usual suspects—griffins, harpies, basilisks, trolls, manticores, the phoenix, mermaids, etc.—as well as fun parvenues—e.g., the Ahuizoti, which was chronicled by Columbus and supposedly had “five hands, with one growing from the end of its tail.” Other interesting entries: the bonnacon, a flatulent European buffalo, which, when frightened, “released a thunderous fart…a sulfur-smelling gas that became flammable and scorched a wide path as far as 100 yards from the beast’s rear end”); the albatross, which can fly for 10 years (true); the Goliath bird-eating spiders, which are as big as personal-pizza platters and actually devour birds; the Mongolian death worm, which “can discharge a harsh yellowish spit that is highly acidic, capable of melting metals and said to be instantaneously lethal to humans”; and the always-fascinating Komodo dragon, whose mouth “is literally a cesspool of biotoxins, containing more than fifty poisonous bacterium, including the deadly staph.” And more: The shock of an electric eel runs to 600 volts, the lantern shark glows in the dark, and the leafy sea dragon looks remarkably like a piece of seaweed. Archival and some contemporary artwork accompanies the entries, most suitably cringe-inducing. However, Largo doesn’t dig very deep here and makes little effort to explain, say, why the bear possesses mysterious significance to so many people or the beaver totemic value. Much remains in shadow, and some readers will wish for more background. Broad rather than deep, but still an entertaining and occasionally enlightening read—perfect for the coffee table or bathroom.